This post may contain affiliate links for your shopping convenience. View our full disclosure policy HERE. I received this book in exchange for my honest review of the book. All opinions are my own. I was so excited for the chance to read and review Mother Mary: Inspiring Words from Pope Francis. Pope Francis always has such a way with words - it is simplistic yet so full of meaning. Sometimes a quick 140 character tweet can say more than pages and pages of words. "For Pope Francis, Mary is an icon of wisdom, strength, courage and joyful hope. Her unconditional yes to God encourages modern believers to say yes to God’s call today." When I read that, I knew I would love this book. Mary truly is an example to us all but especially to Catholics, mothers and disciples everywhere. I really like that this book puts Pope Francis' teachings, tweets, homilies and writings on Mary all in one organized place. Each page is a short excerpt from those and references the specific location if you want to read more. The pages are organized into chapters: Handmaid of the Lord, Model of Faith, Mother of Mercy, Our Refuge and Our Hope, Star of the New Evangelization and Queen of Peace. You really could read these pages in any order. They would make a great addition to your prayer time or Bible study time. Just a quick reflection on Mary to focus your thoughts and guide your thinking. It could also be helpful if you are looking for specific words about Mary in reference to the labels that the chapters are divided into. When I find great new Catholic titles, I instantly think, could this be used in a classroom? Now, not all books are written at a level where children could understand them. Sometimes these books can serve as great background knowledge for us as teachers, catechists and parents. However, this is a book that I think could be shared with students. Each quotation and reflection is short - less than a page and could easily be read and understood by older children. For younger children, they might need some more explanation to better understand. 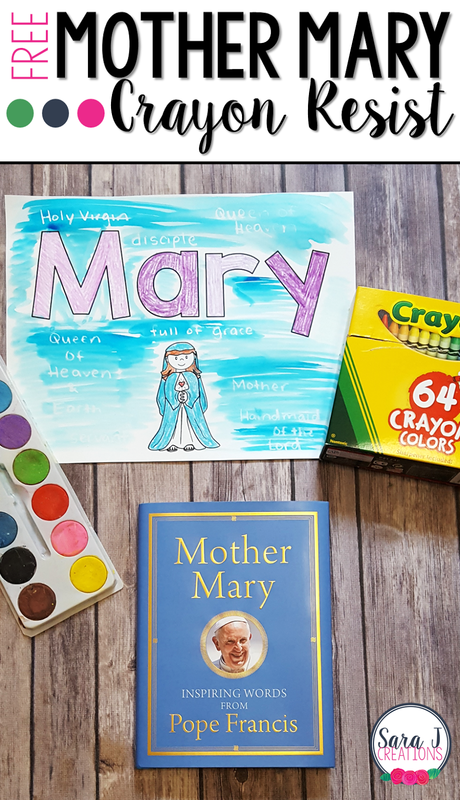 With white crayon, write some of the words used in the book to describe Mary. Older students can write these words inside the letters. Younger kids that need more space can write around the picture. PRO TIP: It is hard to see white crayon on white paper, so hold the paper at an angle in a well lit area. Once all the words are written, get out the water and the water color paints. Paint over the picture. The wax from the crayon will resist the paint and appear through the paint. The final product will be a beautiful watercolor picture that describes Mary, using the words of Pope Francis. Obviously, this project can be done without the book, Mother Mary, but the book provides terms we don't normally associate with Mary such as "model of evangelization." If you would like your own Mary template to use, click the button below, add your information and it will be emailed directly to you.